While Eastbourne is not a major part of Wellington, it has been a good indicator of price changes in the past. �No surprise, it is difficult to get tenants if your price is not set in relation to the rest of Wellington, especially Petone and central Wellington (those who are prepared to catch the ferry). 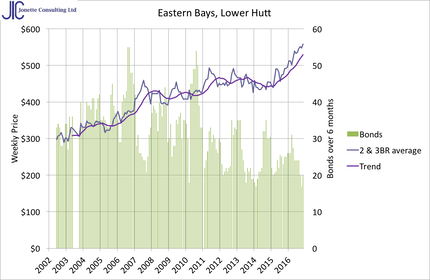 The rise in prices over the last year is similar to one in 2006-2008 but this time probably caused by a shortage of rentals in Wellington - being 45% below normal levels. �The last increase was probably due to catch-up after long stagnation during higher inflation. �Last time there was a lot of movement because there were plenty of rentals on the market (almost 50 at that time), this time bonds are at the lowest ever levels (20), even failing to reach the minimum for publishing one month recently.